we guarantee that our tortilla ovens will keep tortillas fresh, soft and warm for over 1 hour! 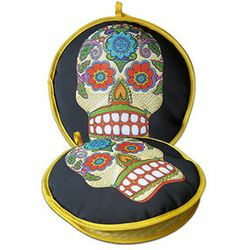 la tortilla oven is a brand name for fabric tortilla warmers. whether consumers microwave their tortillas or use a traditional stove, grill or comal. we understand the heartache in trying to keep tortillas warm from the stove to the table. we feel the pain with getting up during the middle of your meal to re-heat more tortillas. our tortilla ovens have resolved a long problematic issue with keeping tortillas fresh, soft and warm for a long period of time. aside from heating tortillas, our tortilla ovens or tortilla baskets can also be used for: bread rolls, pita bread, quesadillas, empanadas, gorditas, pancakes, wafles and much more. Las tortillas se mantendr�n frescas, suaves y calientitas por m�s de una hora. Caliente sus tortillas poni�ndolas dentro del tortillero t�rmico y despu�s en su horno de microondas. tambi�n puede poner directamente en el tortillero t�rmico las tortillas reci�n calentadas del comal o parrilla de la estufa. las tortillas se mantendr�n calientes durante todo el tiempo que dure su desayuno, comida o cena. El tiempo necesario para calentar las tortillas en el tortillero de tela termico var�a seg�n sean tortillas de ma�z o tortillas de harina. si son tortillas de ma�z por cada 6 tortillas p�ngalas en el microondas por aproximadamente 1 minuto 30 segundos y si son tortillas de harina el tiempo es menor, por cada 6 tortillas de harina cali�ntelas en el microondas un minuto. My order arrived quickly and in excellent condition. The tortilla warmer is attractive, would fit in any kitchen decor. I was pleasantly surprised that it was a little larger than I expected. The packaging is nice. 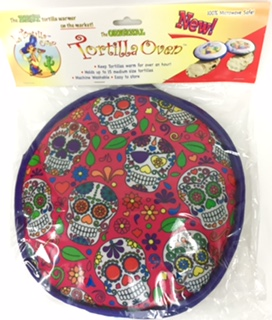 All in all, I was very pleased with Mexgrocer and look forward to giving the tortilla warmers as Christmas gifts.